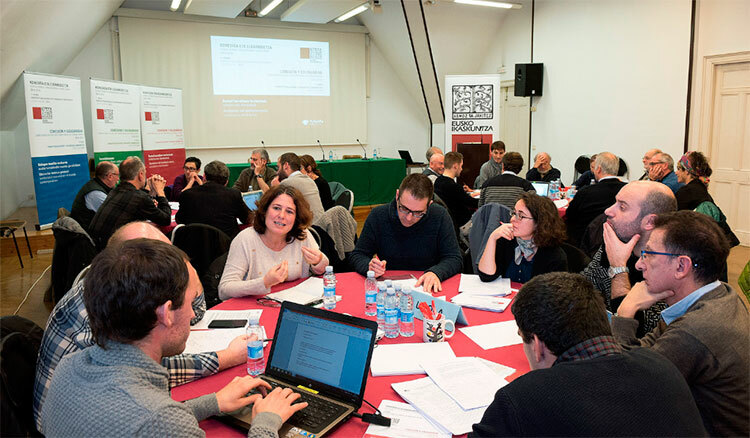 The Basque Society of Studies (Eusko Ikaskuntza) has recently undertaken an interesting participatory process for the elaboration of its Green and White Books “Our Future Together”, on the occasion of its 100th anniversary. This process canbe seen as an experiment in governance. This short contribution aims to give an overview of the complexity of the governance themes and relate them to the Basque process.Transparency, accountability, openness, cooperation and dialogue between actors are key concepts of governance. If we can identify such keywords in the subject of governance perhaps we can begin to sketch the governance approach, but the elasticity of such concepts points to vast territories. As a first approximation, we can relate governance to different ideas sharing, perhaps a family resemblance. 1. Governance can refer to a special political and legal culture, an understanding of the concept of regulation through norms and powers that underpins the whole range of public and private spheres of decision-making. Thus, according to Tatsioulas (2018), the core value secured by the formal-procedural requirements of the Rule of Law is a due respect for the rational autonomy of human beings. Humans possess the capacity to grasp the normative reasons for and against various courses of conduct and to reach and act upon decisions in light of their assessment of the overall balance of these reasons. Systems of governance should respect and enhance our capacity for rational deliberation and practical action by adhering to the Rule of Law’s procedural and formal requirements, and to the principle of self-government. Related to this legal and political culture, the governance approach adopts the norm-user perspective advocated by Neil MacCormick (2007), as opposed to the norm-giver approach, closer to authority-based understanding of sovereignty. 2. Descending in the level of abstraction, Governance can refer to the mix of private and public regulation in any given area. In this approach one need not solve the question whether governance is more law than politics. One looks at the actors involved in the type of decision-making that set standards of conduct for a broader community in any given area. Sometimes the standards are set by public authorities, ideally embodying self-government by the citizens, other times either because Government has retreated or because it never occupied the field, the standards are set by private actors like corporations or non-state organisations. According to some understandings it is the law that determines the mix of public/private regulation and the scope and criteria for non-formal norms to be incorporated into the legal system. But, if this is already problematic within a state legal system or a state constitution in the light of legal pluralist situations, it is even more so in the transnational context, where, as Harm Schepel (2005) argues, it can be questioned whether law can recognise legal validity beyond the nation state to other forms of regulation. One can question whether law can constitute private transnational governance. 3. Related to the public/private regulatory mix and moving one’s reach beyond the adoption of norms or standards, Governance can also be seen as a process and platform (forum) for the attribution of resources and the adoption of decisions that affect the community, in a wider sense. These decisions need not take the regulatory form. The market is one such process and forum, and so is government or civil society. But there are others, depending on the subject matter, and provided we do not reify these concepts: the market, civil society, since they are not uniform but segmented in terms of power, class, gender, age, … The Internet still has the potential to be such a platform, and many forms of social or community association. Eusko Ikaskuntza, or the academic community are another relevant example. 4. Moving to the relations between administrations, Governance is here closer to the relations between the executive and the public administration in a state. We are here in the formal public dimension and look into the relationships between the administration (powers) and society (individuals, political parties, social actors, groups, companies), or at the internal relations inside the administration itself (between different departments, services or units) whether hierarchical or heterarchical, vertical or horizontal. Cooperation, coordination, collaboration, mutual assistance, subordination, … The relationships between the Administration and individuals has traditionally been vertical and hierarchical – top-down – but new participatory and open government initiatives are bringing about a cultural change - bottom up approaches. Experiences in Iparralde (Pays Basque) have been particularly noteworthy. 5. Administrative Governance can also relate to the relationship between different administrations at the same level, or at different levels: the relationships between a higher more general administration with administrations and institutions at a lower level, i.e. territorially closer to the citizen (participation at the local level) or functionally closer to the citizen (administrative agencies), or at a higher level, i.e. more removed from the citizen e.g. “global governance” or international agencies. In the Basque Country, the levels of administration involved is very high: local, provincial (regional), autonomous (national), trans-frontier, state, European, Transnational. The Basque Society of Studies (Eusko Ikaskuntza) has recently undertaken an interesting participatory process for the elaboration of its Green and White Books “Our Future Together”, on the occasion of its 100th anniversary. This process can be seen as an experiment in governance. 6. But another area related to Governance is not how close to the citizen the administration is, but rather how far removed from the state and from public control may the decision-making centre be, as in the case of e.g. “corporate governance” or “private governance” but also NGOs and other non-state agencies and organisations (take the example of sports associations like FIFA, or the UCI). 7. Another approach to Governance looks at the medium through which governance operates, as in physical, real versus virtual, digital or e-governance. Internet governance – the decisions concerning access, control, compliance related to the internet and its modus operandi - and e-governance – relationships with the administrations through electronic, telematic means -are different ideas, but in both we find the common issue of finding the balance or trade-off between national security and open government. 8. Governance can also refer to the combination of all, or some, of these aspects 1-7 in the specific subject areas. One thus finds reference to governance in the following dimensions: security governance, economic governance, governance of the Euro and EMU, scientific governance, governance of intellectual property, governance for sustainable development, environmental governance, climate change governance, food and health governance, fisheries governance, marine spatial planning governance, or ocean governance for global trade, governance of cultural diversity, even the governance of digital game environments, … This is an open list, obviously. 9. Finally, according to cultural, even religious, approaches to law, one can probably speak about Catholic governance – itself very complex – or about Islam or Muslim governance (Moten 2017), where the Quran and the Prophet’s traditions and virtues (Sunna) are the source for extracting a clear general principle of a good government among Muslims, most particularly, the Shura principles of consultation in legislation. Arguably, along similar lines, it would be possible to refer to Judaic governance, to Christian governance, even to Catholic or Protestant modes of governance, even within each of these, subdivisions like Franciscan, monastic, Jesuit, integrist, Presbyterian, Mormon, …, each depending on the degree of secularisation of the society. An interesting recent study about such pluralist modes of mediation or governance within the Catholic movements is Xabier Itçaina (2019). – Tatsioulas 2018: Tasioulas, John, The Rule of Law (July 19, 2018). Forthcoming in John Tasioulas (ed. ), The Cambridge Companion to the Philosophy of Law (Cambridge University Press, 2019); King's College London Law School Research Paper No. 2018-21.